The UK Coach division of National Express Group has partnered with Highways England to support their latest road safety initiative. The ‘Don’t be a Space Invader – stay safe, stay back’ campaign uses the well-known Space Invader video game character to alert drivers to the anti-social nature and risks of tailgating. A retro ‘Space Invaders’ poster will feature on 12 coach rears and stickers have been added to bumpers of the remaining 500 plus fleet of vehicles to remind people travelling at speed that tailgating is dangerous. National Express Chief Executive Officer, Chris Hardy, said: “This is a great opportunity to highlight this important safety issue. 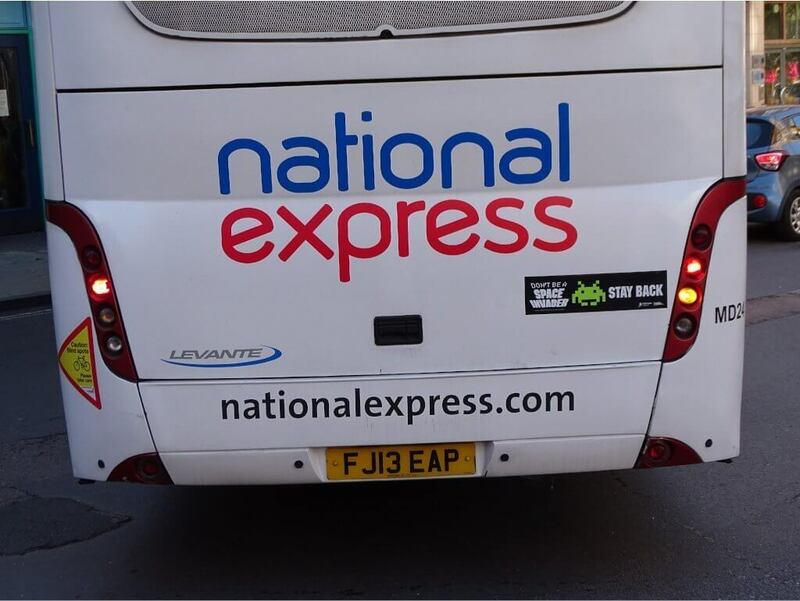 As the UK’s largest coach operator, we experience tailgating of our vehicles and fully endorse the message to not be a Space Invader and leave enough space. Highways England are sending the Space Invader bumper sticker packs out free for up to four packs, there is also an option for fleet orders. Further information can be found at highwaysengland.co.uk/staysafestayback/.